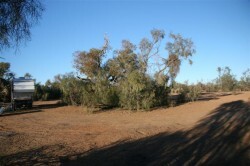 We travelled from Leigh Creek, via Lyndhurst, through barren gibber plains and clay pans – hardly any trees or shrubs, through Marree, then travelled north towards Muloorina Station. More of the same country and we were wondering if we had made the correct decision, until, after 50 Km off the Oodnatta Track, in the distance, what seemed like a mirage, we saw some hills, and some trees. 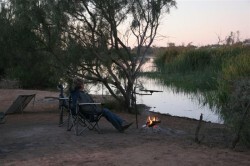 to our amazement, we arrived at this wonderful lagoon, surrounded by trees and quite a few campers. The weather was warmer, but with no power, we were hoping that the nights would be kind to us. They were cold, but we were as warm as toast and as soon as the sun rose, it was better to get up, make a cuppa and sit in the sun. As soon as we arrived, I put a yabby net in, but to no avail. Checking morning and night, no luck at all – not even a beatle. Apparently there are small fish in the lagoon, but nothing found our old lamp chop bones and old steak appealing. I even had the garlic butter for them! We have camped by a weeping acacia, which is absolutely stunning and gives us much needed shade. Cattle come down to drink at night. 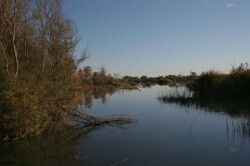 The lagoon flows rapidly at its north end. There are septic toilets here, but no showers. The bird life is fantastic – it is really great to hear birds of all descriptions here. Water birds, parrots, honeyeaters. We have spotted Galahs, Corellas, Coots, Pelicans, White Plumed honeyeaters, Willy Wagtails, Square Tailed Kites, Hawks, Osprey, Crows, Great Egrets, Mudlarks, Noisy Minors, Sandpipers, Purple Swamp Hens, to name a few. We woke on our second day to find a Pelican sleeping on our camp table! He gingerly moved away and sat under the Acacia. We thought he looked quite young, but pretty sick, except he would preen himself for ages every hour. Russ went out to collect some wood and when he came back, he emptied the bag of wood out, making a loud noise, and the pelican scampered into the water. We were convinced that we would have to be digging him a grave, but later we saw him swimming and catching fish. We then wondered whether he was exceptionally tired after flying from Lake Eyre, where apparently the parents discard them and send them on their way, as the water recedes. We have loved it here and a donation of $8 per night goes to the Flying Doctor and it is well worth it, except for the FLIES!! We have laughed at people with fly nets over their hats, but this time the laugh was on us! Muloorina sound fantastic. We tried yabbying at the farm recently with no results except freezing hands and wet feet but on googling it discovered that winter is not yabby hunting season so don’t feel too bad about not catching any. I’ve since decided that winter is for snuggling up, drinking port, eating pies and getting fat, not bad but……roll on spring! I believe this website contains some very great info for everyone : D.
Glad you enjoyed the blog and found it informative. Hope you have a good time there!